I took a long break from updating this blog but I'm back. Weekly updates to follow. Two events planned for the next month. Excited for the work ahead. No words, just pictures. Kasumi, visible. Next up was Heavy Negatives, a band with a very soft spot in my heart. Their set was plagued by equipment issues, but their Addams Family inspired outfits were on point, and they ended up triumphing over these difficulties. The lens also functions admirably in low light, especially on the A7 body, even at a relatively high ISO. Combined with a flash it also produced some lovely portraits. Full manual in the dark is a work in process, but I look forward to the challenge. I was upstate for a hot second this weekend for my sister's birthday. Driving over 11 hours this weekend was a lot. So please accept the following three autumnal pictures in the spirit of brutal exhaustion and 85mm/1.4 portrait lens. I was possessed by the spirit of a stock photographer. We both like cats. Given permission, I will post more photos of the birthday, but the following photo is a good representative sample of events. 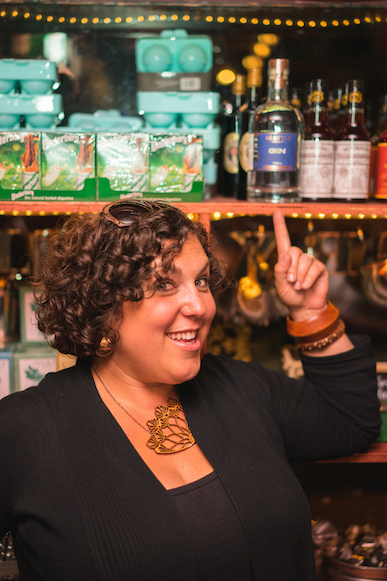 Last Thursday I took photographs for a NYC Gin Society event at Amor y Amargo. The NYC Gin Society is an organization that sponsors events connecting members with new gins, new cocktails, and opportunities to meet the mixologists and distillers behind them. I was connected to this event through my friend John, pictured below. While I was there, I met Tami, who with her husband Paco are one of the couples behind Seattle Distilling on Vashon island. Seattle Distilling has a wonderful origin story. According to Tami: "Paco grew up in a family that brewed its own spirits in handcrafted stills, creating liquor out of whatever raw materials were available -- Once they even used grass, which is kind of hilarious and bizarre!" Later he left the country for Seattle, but never lost the love of carpentry, crafting, and most importantly spirits. He shared his dream of starting a distillery with Tami and day they met their future partners, Ishan and his wife, Amanda at their preschool and gluten-free baking club(!). Ishan and his wife had started a distillery on Vashon Island, a small island in Puget Sound outside of Seattle. "I told Paco about this and suggested he might be able to offer to work with them to construct their still. He visited their web site and the first thing he saw was on the page was an image of their beautiful copper and wood distillery equipment." Nicole and her gin-loving beau celebrate her birthday. The couple was discouraged but not defeated. Tami says "I met Amanda first, I told her how we admired their stills, and she told me that their still photo was stock photography and that they were looking for someone with distilling experience. So we got the husbands together and they hit it off immediately and merged their distillery concepts into one. They built the still together, out of copper on top of a vintage stainless steel steam kettle. That's the gist of it! From that moment on the couples became a team and Seattle Distillery was born. Seattle Distillery has just finished a rebrand and is currently focusing on four core products, a whiskey, a gin, a vodka, and a coffee liquor, all crafted from local ingredients. I'm going to try to see their stills the next time I'm out West, but until then it was wonderful to have a taste of my second home. Until next time, Seattle! Seattle Distillery bids NY adieu. There is something so magical about the light our phones cast on our faces, and the expressions when we show when we disconnect from the people we are with a connect with events or people elsewhere. Philosophically, I believe we should all be more present, but aesthetically, I am a little obsessed with this almost voyeuristic window into the lives of the people around me. Sometimes when I think about my life, I think about how incredibly fortunate I feel for the people I know and the experiences I get to have. And almost immediately after, I think "I'm not lucky, I'm blessed, yes" and then Nicki Minaj's "Moment for Life" is stuck in my head on endless repeat for the rest of the day. I'm convinced the world is currently on a collision course with disaster but I'm so happy with the life I'm getting to enjoy before that happens. Wow. That was bleak. But I DO feel lucky. I get to spend every Sunday on a beautiful rooftop with my friend Emily and a forest of plants tended to by her boyfriend Daniel. It's a perfect way to end one week and prepare for the next. minimal editing. There is no Lower Manhattan, only Zuul. But last week, I cheated on the roof. Twice. Saturday, John, Tex, and I stood on one rooftop and spied on the rooftop Tex and I would be on the following afternoon. I also spied on John and Tex, although John eventually tired of pretending to not notice being photographed. The next day after a too brief moment spent in Emily and Daniel's oasis, we journeyed back into the city to visit Sean and Samantha's as the sun was setting. The view was beautiful. The company delightful. As day passed into night, Samantha went downstairs to prepare for Monday and Sean agreed to some flash photography before we went on our way. It was a wonderful weekend full of intimate time with good friends in quiet outdoor spaces in a city that doesn't always offer offer anywhere near enough of either. As Ms. Minaj said: We're not lucky, we're blessed. Yes. I swore off brunch many years ago before leaving NYC for Seattle. I still eat a weekend meal involving eggs around 1PM every Sunday with my friend Emily, but I aggressively avoided a.) anything more than a ten minute walk from my house, b.) anything that had opened in the past six months, and c.) any brunch group larger than three people. I couldn't handle waiting in line for my first meal of the day, in a restaurant that didn't take reservations, and wouldn't sit anything less than a full party. But in the last few months I've mellowed. I've managed to generally eat a solid meal early in the day, gotten to the gym, and had several cups of coffee before venturing on a train to suffer the indignities of people really excited to see and be seen drinking their first mimosa of the day. Last week, I had a wonderful meal with Kasumi at Ngam, but sadly got few workable pictures of the delicious meat skewers, sweet and savory banana pancake, and awesome thai ice tea ice cream we shared. The meal was so good I briefly felt love for the teens texting in front of us and ignoring each other and the incredibly wealthy foreign family to our left. We plan to return in the near future and hopefully this time I'll have the right lens/camera equipment. This weekend, my friend Colin and I went to Maharlika, keeping with the theme of the cuisine formerly known as "Asian fusion." I had prepared poorly. I had only eaten a low-fat yoghurt in the early AM and then worked out intensely. I was short of caffeine and got a text on my walk over informing me we couldn't be seated until I arrived. I walked in and Colin was waiting at the bar in an essentially empty restaurant. The menu did little to inform an American reader what the various Filipino delicacies were. The information architecture was off. The waiter was helpful though and once my initial wave of hangry wore off we were treated to an amazing meal. First off, was the Eggs Imelda, described to Colin as "our version of Eggs Florentine." However, no one had prepared us for the huge head-on prawns. I became incredibly jealous until my plate came out. Taro Root Chicken and Waffles, with a sardine butter and caramelized syrup. It was sweet and rich and fatty and salty and umami and wonderful. I don't remember much after that. The restaurant filled up and I didn't care. My stomach was happy and so was I.
Colin, however, remained skeptical about the world. Oh, Colin! Inspiration, daily work, food. Three updates per week.